This Camellia is a Moosey original, planted at the shady side of the house like all good Camellias should be. It starts flowering early (in July, for me a winter month) and the display lasts for weeks. 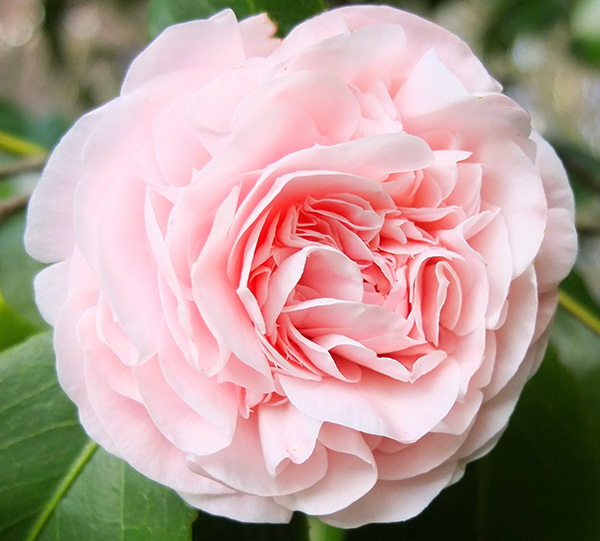 I have no way of ever knowing what type of Camellia this is. It's certainly a big healthy bush - over head height, and rather wide too. I'm grateful that the colour is so subtle. Pink flowers are just gorgeous when they pop up in the dead of winter. Like older varieties the flowers turn brown on the bush, but this doesn't worry me. When I'm organised I do a spot of grooming - the resulting pink and brown mulch on the soil below looks quite stylish! 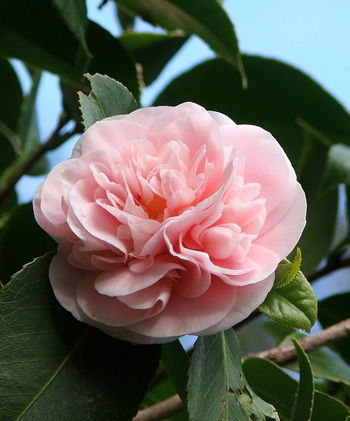 As an easy-care shrub in the Moosey garden, the baby pink Camellia has a few pruning sessions - some forced by branches breaking in winter snow-falls. I've abandoned the 'bird-can-fly-through' pruning rule, though. My focus is merely a matter of restricting the sideways sprawl. I always pick spring flowers for the house from this bush - and each year I always take lots of close-up photographs. These are often out of focus - perhaps this camellia is just too pale and shy?